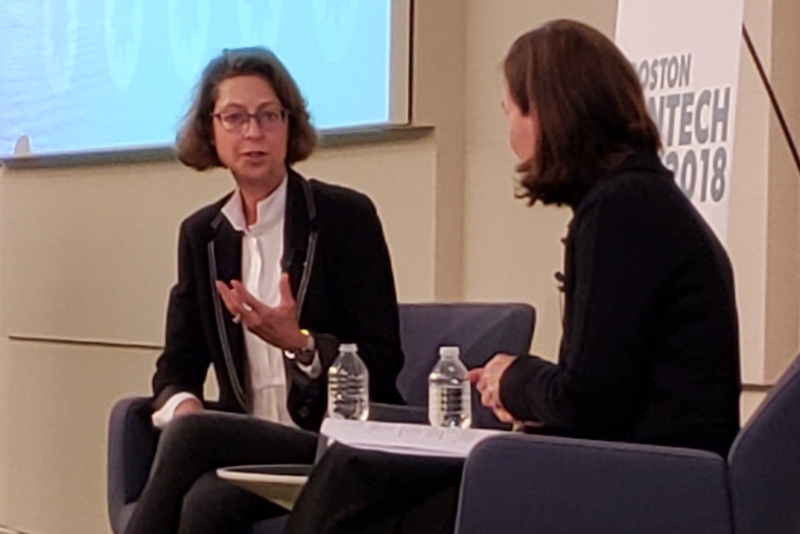 Fidelity Investments is cooking up more blockchain and cryptocurrency-related products and services, with a goal of rolling some of them out in the next few months, according to CEO Abigail Johnson. Jeff Engel for Xconomy (FinTech Futures’ sister publication) reports that Johnson made the comments during an event held at the financial services giant’s downtown Boston headquarters – one of a series of events that were part of this year’s Boston Fintech Week conference. In a wide-ranging conversation with local fintech leader Sarah Biller, Johnson was light on details about what Fidelity’s employees are working on in blockchain and cryptocurrency. Those announcements will be closely watched. Banks and other large financial institutions have mostly taken a wary stance toward cryptocurrencies, such as Bitcoin, and the blockchain systems that power such digital currencies. Fidelity is one of the large financial services firms that has been open about its interest in the sector, which enjoys a ton of hype and investment, but has yet to deliver any products with widespread adoption or significant impact on businesses or society. If any of the internal projects that Johnson hinted at turn into real products, they might help boost the budding industry and bring it further into the mainstream. They aren’t Fidelity’s first foray into blockchains and cryptocurrencies. In 2015, Fidelity Charitable, the firm’s independent public charity organisation, began allowing philanthropists to donate to nonprofits using Bitcoin. Last year, people donated $69 million in Bitcoin and other cryptocurrencies to Fidelity Charitable, nearly ten times the amount of the previous year, the organisation said. Fidelity has also made money from Bitcoin and other cryptocurrencies. As has been previously reported, the firm started a cryptocurrency mining operation that became profitable. Johnson said it was “never the intent” to make money off of it. As of this writing, one Bitcoin is worth more than $6,400. It was worth nearly $20,000 last December, up from less than $1,000 in early 2017. The wild price swings are one of the challenges for the sector, and some researchers have suggested there may have been coordinated price manipulation. The US Justice Department opened a criminal investigation into the matter earlier this year. For Fidelity, the crypto mining operation is part of an effort Johnson and other company executives began a few years ago to better understand a new and often confusing sector – and figure out whether (and how) Fidelity should jump into it. The firm’s internal projects have spurred at least one outside venture: two key members of Fidelity’s blockchain/crypto team left the company earlier this year to launch Castle Island Ventures, which raised $30 million for its debut venture capital fund that will invest in start-ups in this sector. The bigger picture is that Fidelity and other large, long-tenured financial services firms are investing in new technologies and experimenting with parts of their business models to try and better serve consumers – and make sure their businesses don’t get upended in a rapidly evolving industry. In addition to blockchain projects, Johnson highlighted Fidelity’s investments in machine learning and data analytics to make the company’s services more personalised; cloud-based processing of transactions; and a virtual financial assistant named Cora, developed using virtual-reality tech from Amazon. Still, Johnson said Fidelity’s leaders don’t think financial services will “go 100% electronic”.